Without question, hooks are one of the most important pieces of tackle, but hooks do not always meet every specific need. If you are creative, you can modify your hooks, by following these five hook hacks, to meet those unique situations where regular hooks are not measuring up. If you are practicing catch and release angling, and need to unhook a fish quickly, with the least amount of damage, you can modify your hook from barbed to barbless in a matter of seconds. For most hook sizes, you only need a needle-nose pliers to do the job. Just use the pliers to squeeze down the barb and you are ready to go barbless. For large hook sizes, you may need a file or a metal clipper to remove the barb. Another bonus for barbless hooks is that they are much easier to remove from skin, if you accidently hook yourself. Removing a treble hook from a fish’s mouth can be a pain, taking valuable time away from fishing , while doing excess damage to the fish. You can switch your treble hooks to single hooks, without changing the action of your lures, with a few quick clips. Just use a pliers to snip off two of the hooks, just below the barb. Now you have a single hook that will be much easier to remove from the fish. Small fish are adept at stealing live bait from hooks, without getting hooked. This frequently happens because the gap on the hook is too wide. You can eliminate this issue by narrowing the gap on your hook. The best way to close the gap is to use a pliers to bend the tip of the hook toward the shank. Bend it slowly and carefully, so you do not damage the hook. You can turn any of your single hooks into a weedless hook in a matter of minutes. Take a piece of 20-pound fishing wire, preferably 8-12 inches, and tie it to the hook. Slide the knot to the eye of the hook; then wrap the wire around the shank three times, just below the knot. Take the loose end of the wire and pull it toward the barb. At the barb, loop the wire and bring the loose end back towards the eye. Again wrap the wire around the shank three times. Apply some epoxy glue to the wraps and knot, trim any excess wire and you have a weedless hook. 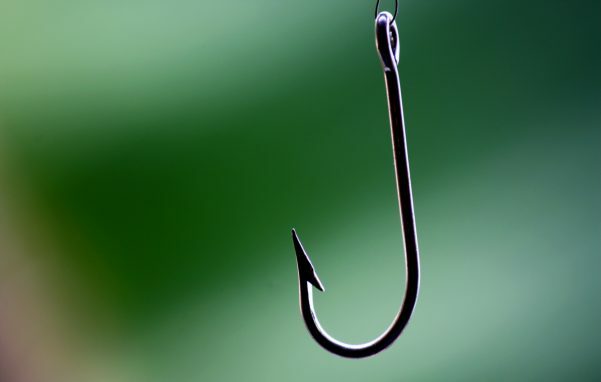 Dull hooks can cost you fish, because they make it more difficult for you to set the hook. Periodically sharpen your hooks to keep them in top working condition. The best way to sharpen a hook is by using wet/dry sandpaper , preferably 1,000 grit. Wet the sandpaper and run it from the base of the barb to the point. This also removes any damage or blemishes in the hook.